The specification for the TellusSW airborne geophysical survey (http://www.tellusgb.ac.uk/) was developed in March 2013. 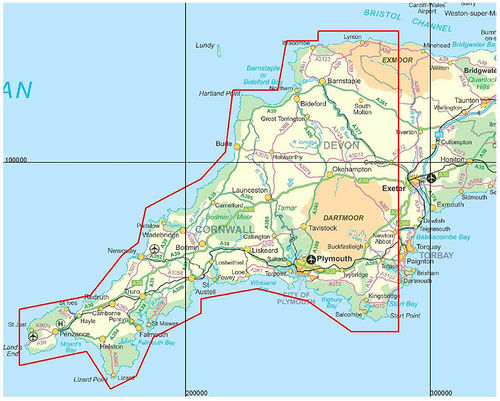 The survey area (10 929 km2) was centred on the onshore area of SW England and contains an offshore ribbon extension (Figure 1). Figure 1 TellusSW Survey area (red polygon). Coordinates are British National Grid (m). Tellus SW is the latest phase of a series of projects that have acquired modern, high resolution airborne geophysical data in the UK and Republic of Ireland. The UK, and recent Irish, surveys flown between 1998 and 2013 are shown in Figure 2. The original HiRES-1 North Midlands survey (Peart et al., 2003) of 1998 was largely acquired at lower spatial resolution (400 m line spacing) and at a higher elevation (90 m) than later surveys. Figure 2 HiRES airborne geophysical surveys in the UK (1998-2013). The 3 Tellus surveys are labelled with italics and underline (NI: Tellus Northern Ireland, TB: Tellus Border, SW: TellusSW). The three Tellus surveys, combining airborne geophysics and ground geochemical sampling, are identified in Figure 2. In contrast to previous Tellus surveys, TellusSW did not acquire airborne electromagnetic (EM) data alongside the standard magnetic and radiometric data. This was largely a result of both time and budget constraints. The survey plan provided an estimated 60 000 line-km of geophysical data. The survey acquisition production dates were from 1 August 2013 to 02 January 2014, i.e. acquisition was conducted over a 5 month interval. These set of pages linked provides further details and production rates as supplied in the contractors report. The contractor used a triaxial magnetometer system (wing-tips and tail). This system further provides an estimate of localised measured horizontal gradient using the along- and cross-line gradients. The sampling of the magnetic data was 20 Hz providing an along-line sampling of 3.56 m using the mean survey speed noted later. The sampling of the radiometric data was 1 Hz and this provided a mean along-line sampling of 71 m.
The objective of the airborne survey is to provide high quality data for geological mapping, resource assessment and environmental management. Integrated with the other planned project information (e.g. soil and stream sediment geochemistry, airborne LIDAR), the data will contribute to the promotion of mineral exploration and environmental research and management in the fields of hydrogeology, soil-carbon/peat inventory, natural radioactivity, radon risk and geo-hazards. The present report summarises the data delivered by the contractor and then provides an Appendix formed from the combined logistics and processing report delivered by the contractor. Since the combined report is highly verbose in terms of logistic detail, we have extracted the information of direct relevance to the delivered, processed data. ↑ PEART, R J, CUSS, R J, BEAMISH, D and JONES, D G. 2003. The High Resolution Airborne Resource and Environmental Survey- Phase 1 (HiRES-1): background, data processing and dissemination and future prospects. British Geological Survey Internal Report, IR/03/112. 28pp. This page was last modified on 6 August 2015, at 09:39.